Above & Below: Mouse, shown above in direct sunlight and below with a flash, is a warm-toned grey-beige shade, or a light taupe. All photos are shown using 2 coats. Below: A quick bottle comparison shows you that Mouse is quite similar in shade level to Orly's Country Club Khaki, although it's a richer and warmer shade. 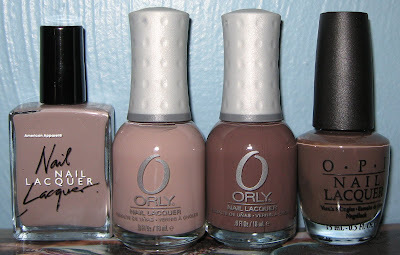 Orly's Prince Charming and OPI's You Don't Know Jacques are to the right of Country Club Khaki. 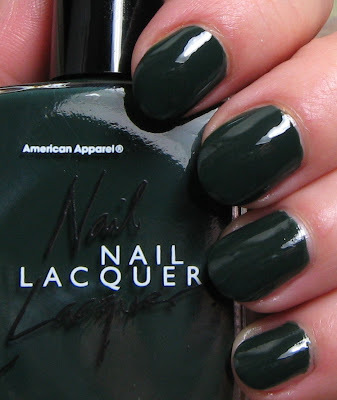 Below: Hunter is a deep Forest green shade, but not so dark that it looks black. Below: Another bottle comparison. 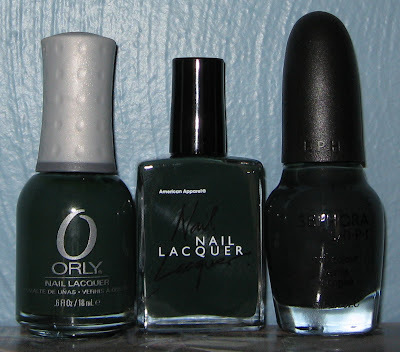 Orly's Enchanted Forest is the closest match I have, while Sephora by OPI offers a much darker hue with Dark Room. Below: Manila, even after adding a few drops of thinner, is still a little thick. 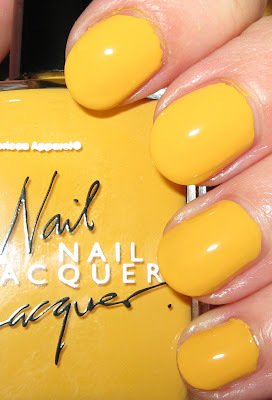 In it's praise, I'll tell you that for a yellow shade, which are notorious for streaking, this one applied very well and gave an opaque look with just 2 coats. The photo is showing this shade a little brighter than it truly is, and for classification purposes, I would call it a Goldenrod yellow. 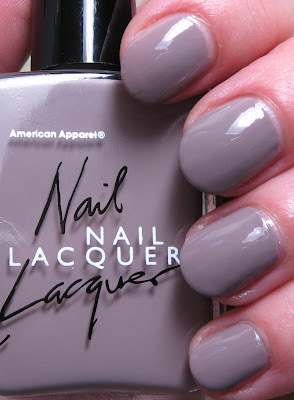 I have 3 more reader request swatches for you from American Apparel's recently released polish collection. You can find the first 3 I posted just below this post. There are 18 colors in this debut offering, and I believe they are all cremes. The shades are actually standard colors as far as colors go (take a look in the 96 piece Crayon box), but not so standard with regard to nail polish colors. That's what I like about these the most, is that very few of them are close to anything else I have in my collection. I did add thinner to all of them after having problems with a somewhat thick formula on my first swatches, and that made a big difference in a good way. Manila is still thicker than what I'd like, but I can fix that later. Otherwise, 2 coats gave me a very nice finished look, and the drying time was good. Yesterday I shared an excerpt from AA's press release, which gave the origin of some of the shades and their names. I don't know the origin of these 3, but I'm most curious about Mouse. For the initial run of bottles, which will be sold exclusively in American Apparel shops worldwide, the creative directors found a true family-operated nail polish manufacturer in New York City with whom they instantly connected. Together they worked to develop a beautiful high-quality polish using the techniques and secrets the family had been using since the early 1970's--symbolized best by the 91-year-old grandmother who still fills the bottles. "It was important to us that we work with a domestic manufacturer who had a long history in the business. Like our clothing, the palette is intended for year-round use. It's a painterly range of colors designed for long-term appeal and creative interpretation. We put equal focus on making sure the polish and the colors were both durable and beautiful," said Marsha Brady, a creative director for American Apparel. The part about the 91-year-old grandmother still filling the bottles is pretty impressive. It sounds like American Apparel did everything right with their foray into nail polish, from the color choices, to finding an American manufacturer with deep roots in the industry. I wanted to mention that one of my readers left a comment yesterday that these polishes are indeed available in the 3/$15.00 pack pricing online. I had called when I placed my order about that, but at the time, they weren't offering a price break on multiple bottles. I could've gotten 3 more bottles at that rate, and then I would have had them all. Oh well! Ooh! I have been wanting Mouse, I quite love the swatches I've seen of it and yours are pretty too. I can't resist these taupes! I can't resist yellows either. That's a very, very pretty shade of yellow! They all look beautiful on you. You really take wonderful photos and give great descriptions. Mouse I really like but the thought of the name creeps me out! Since all of these have near dupes I don't have to worry about buying these.